The last time we reported on the Apatosaurus cervical-shaped Umbaran Starfight from The Clone Wars, we’d heard from the concept artist Russell G. Chong, who had done the final design on the startfighter, and who told that he wasn’t aware of a sauropod original to the design. 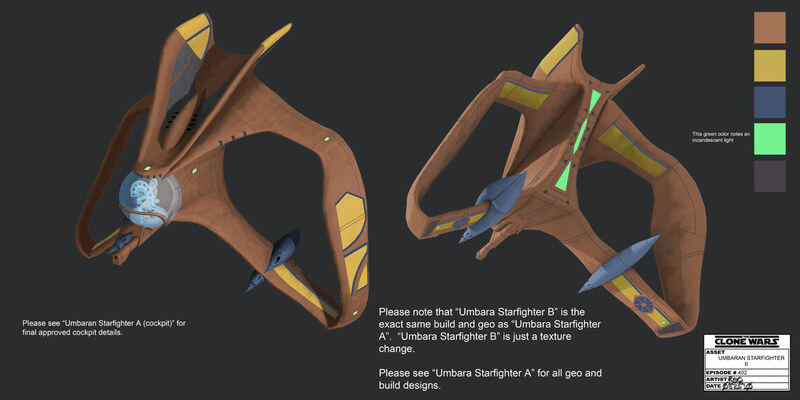 Subject: Is the Umbaran Starfighter from Clone Wars inspired by an Apatosaurus vertebra? We’re trying to figure out whether this is deliberate as it appears, or just a crazy coincidence. The design was finished by Russell, but he wasn’t its originator, and thinks you might be the man — or know who was. 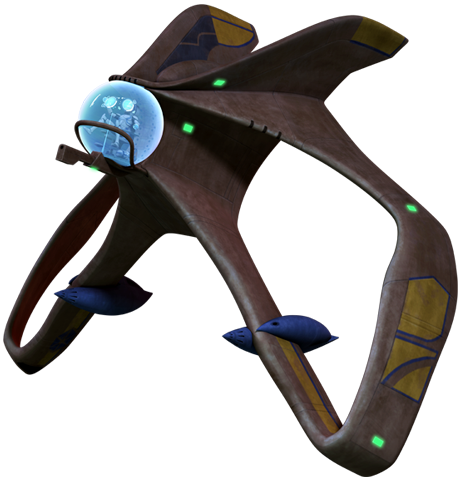 Subject: Re: Is the Umbaran Starfighter from Clone Wars inspired by an Apatosaurus vertebra? I read the blog posts — interesting commentary! I remember the original design perfectly, and you are absolutely right, I was inspired by the skeletal forms of dinosaur bones. It’s pretty cool that you were able to discern that! 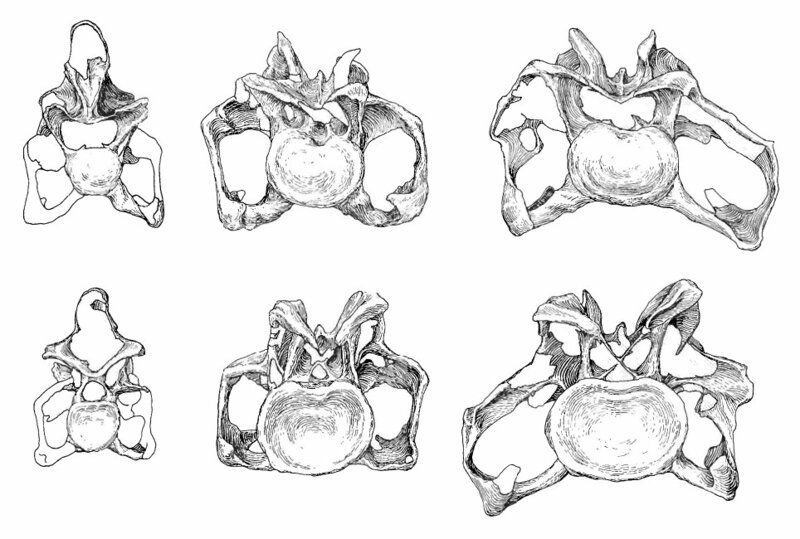 I’ve looked for the original photo I took of the vertebra, but it seems to be lost in the archives. 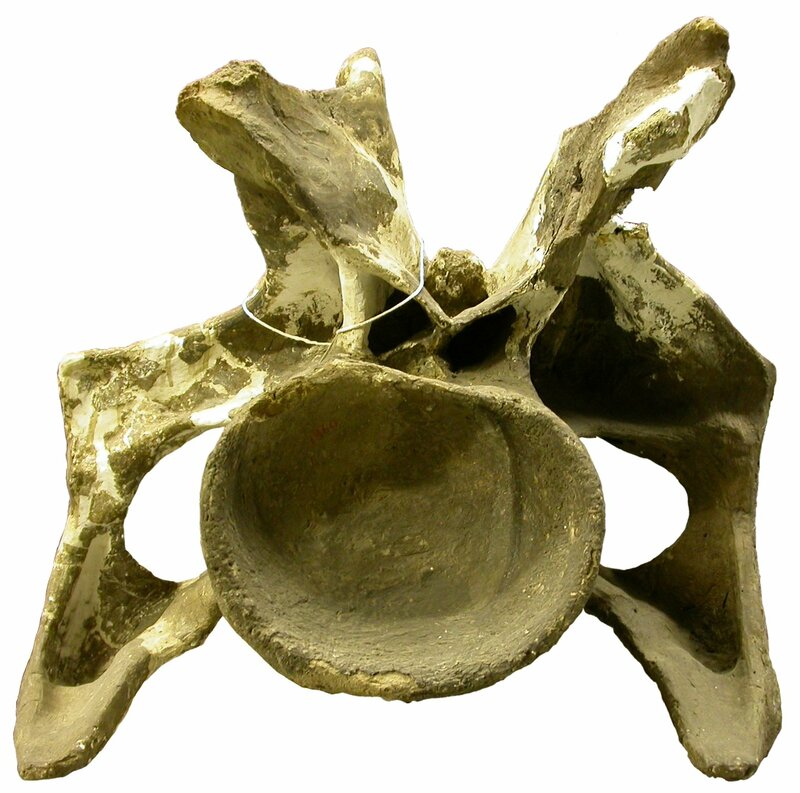 I can’t confirm that it was of an Apatosaurus vertebra exactly, but it’s quite possible. I was at the California Academy of Sciences in San Francisco and took a number of photos that day. Nature renders complex and beautiful designs; I often find myself drawn to studying organic forms and patterns as inspiration in my vehicle designs. 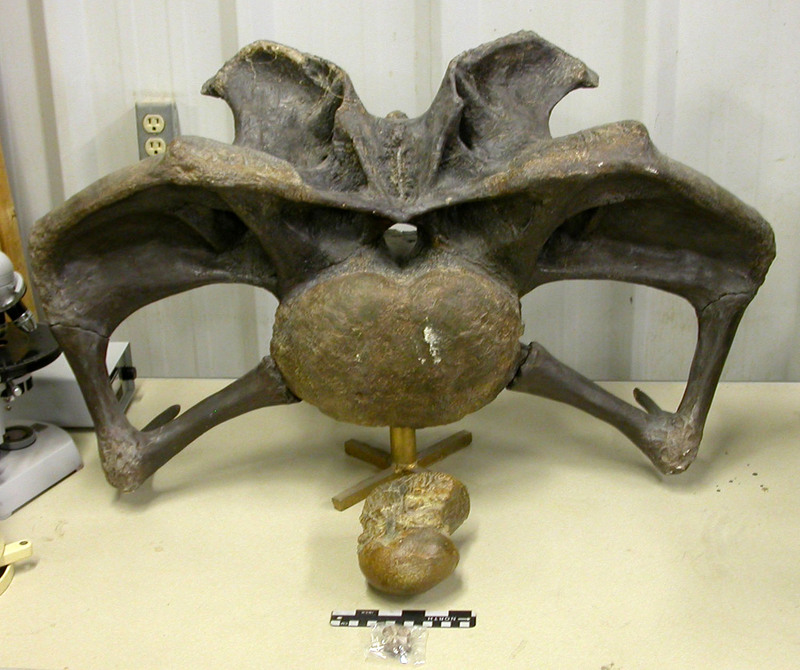 The bone was presented as a single vertebra on public display. I’m uncertain that the collection will be the same now. 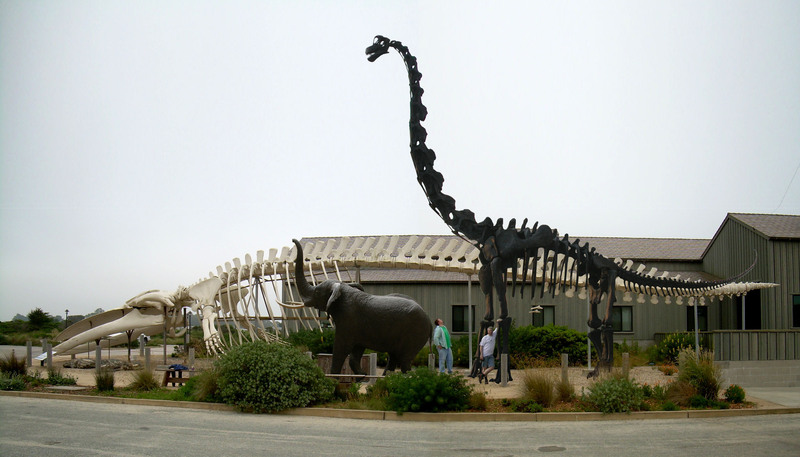 I took the photo back in 2007 just before the California Academy of Sciences moved into their present location in Golden Gate Park. I’m sure there have been a lot of changes since. I will continue the search for the original photo. Will let you know right away if I find anything. So this is great news! Matt’s initial hypothesis is confirmed from the horse’s mouth. All we need to wrap this investigation up is a photo of the original exhibit. 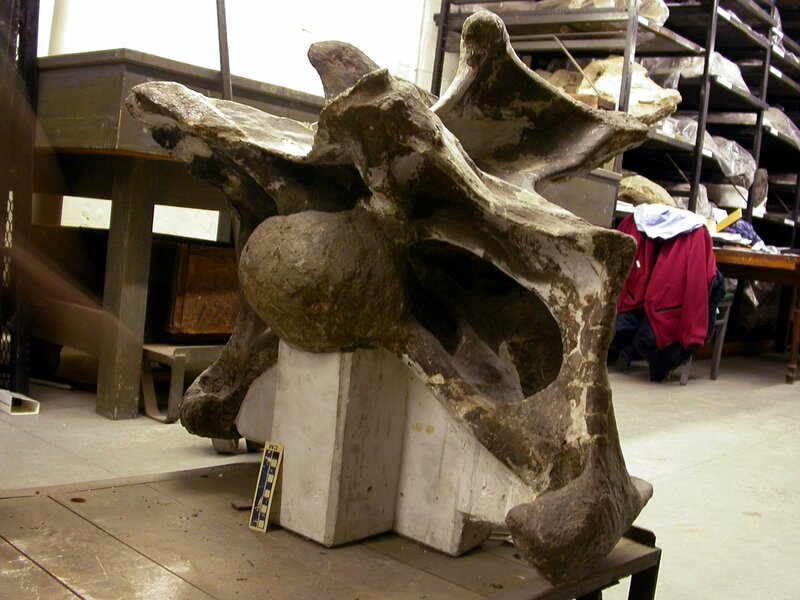 Does anyone out there have a photo of an isolated Apatosaurus vertebra that was on exhibit at the California Academy of Sciences in San Francisco before it moved to Golden Gate Park? Or does anyone know someone who works at CAoS that we could talk to? 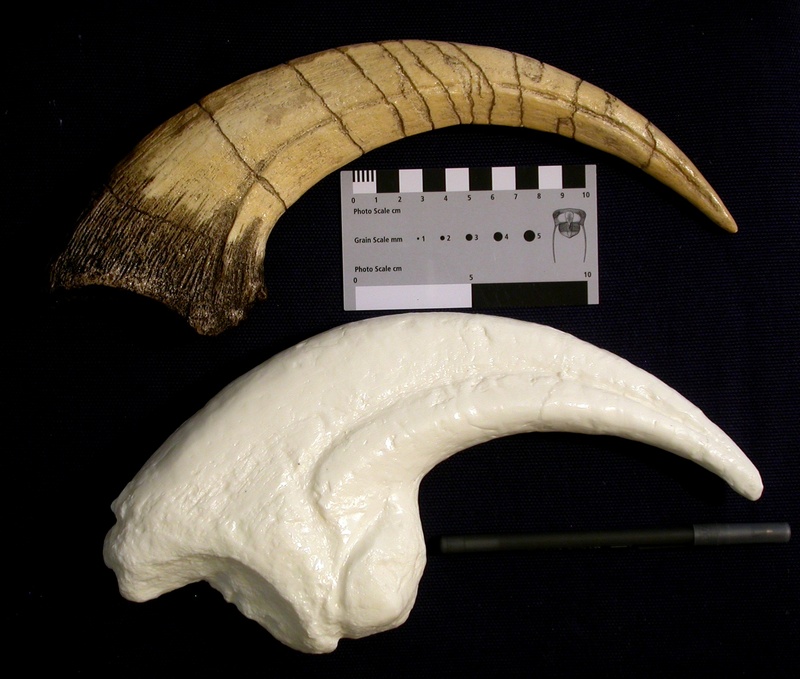 This discovery has been covered at sci-fi fan site io9! 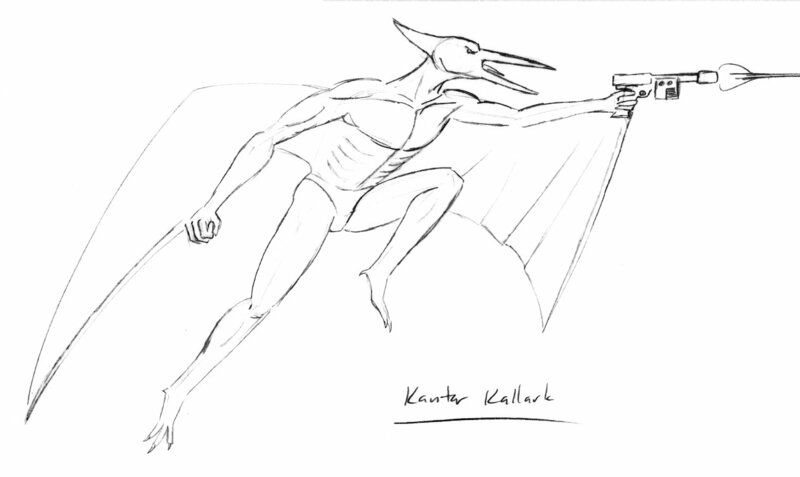 The Clone Wars “Plan of Dissent” episode concept art gallery features some conceptart of the starfighter, with the artist initials “RGC”. I believe that’s Russell G. Chong, one of the show’s art designers. You can find his contact information at his website. He might not be the one who came up with the design–that art looks too polished to be an early concept—but he would probably know who did. Hi, Russell. 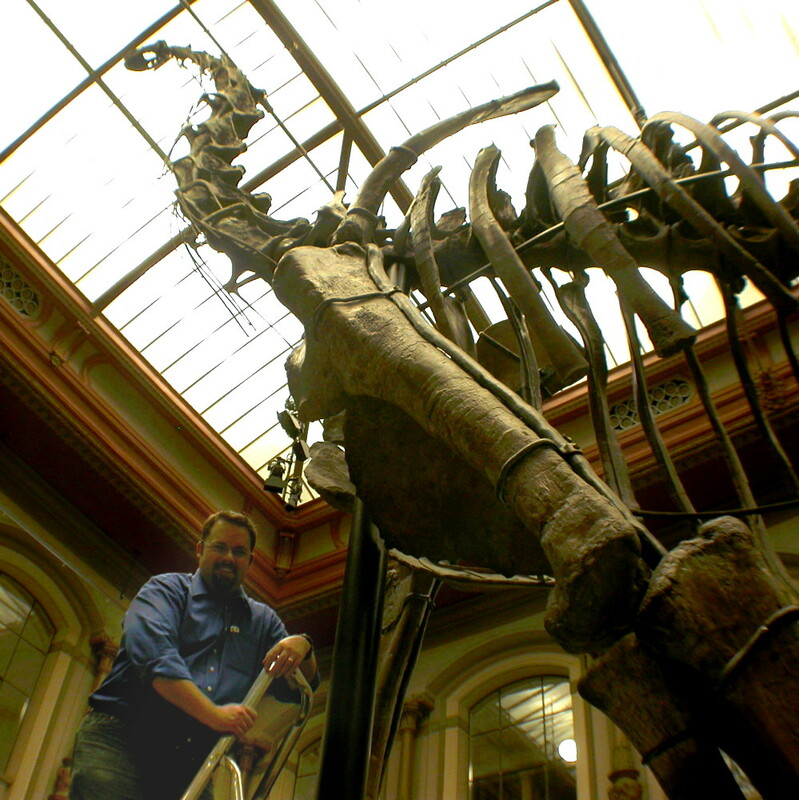 Matt Wedel and I are palaeontologists, specialising in the neck skeletons of sauropod dinosaurs. 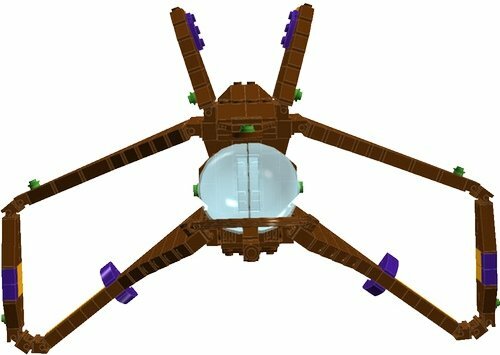 Matt noticed that the Umbaran Starfighter seems to be closely modelled on an Apatosaurus vertebra — see these two blog posts. We’re trying to figure out whether this is deliberate as it appears, or just a crazy coincidence. One of our commenters believes the design might be yours — can you comment? I’ve been away on vacation and I just found this email. 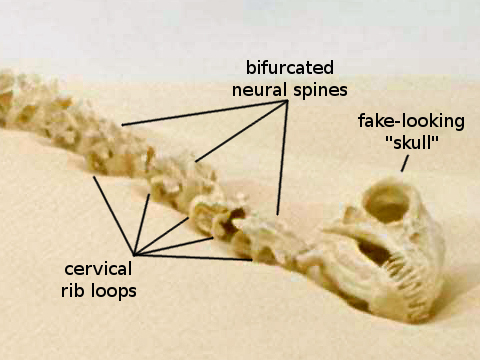 That’s pretty trippy that the vertebrate looks so similar. It’s also pretty trippy that palaeontologists are watching clone wars. I did have the final design for this ship but I didn’t do the original ‘inspirational’ sketch. George often goes thru a book of older sketches from the movies and randomly picks stuffout for us to ‘fix’ or ‘cleanup’. My input was to give it more extreme character so I sharpened some edges and made the fins more pronounced, figured out how to land it, design a working cockpit, and then gave it final color. I don’t know who did the original but I don’t recall any notation saying they based it on the Aptosaurus vertebra so I have to say, yes, it’s coincidental. Russell also gave me a lead on where I might look for the original designer. I’ll follow that up, and report back in a later post. And asked whether it’s based on a cervical vertebra of Apatosaurus. 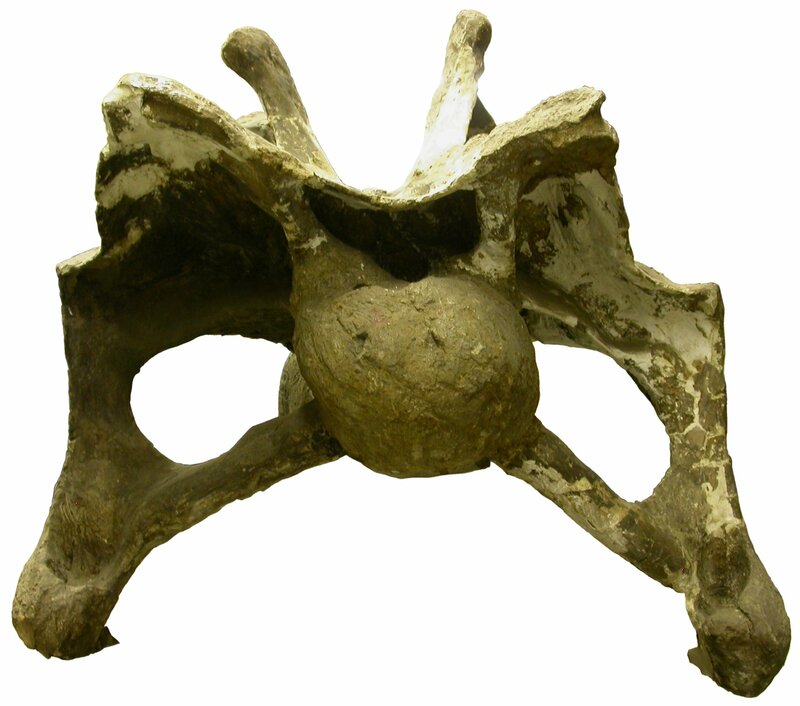 Apatosaurus ajax holotype YPM 1860, cervical vertebra of unspecified position but probably from around the middle of the neck, in left anterolateral view. 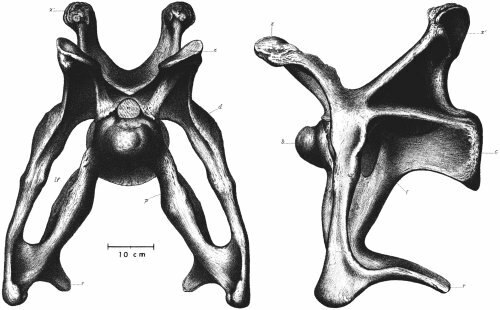 This is the same vertebra that appears in the last three photos in Matt’s post. 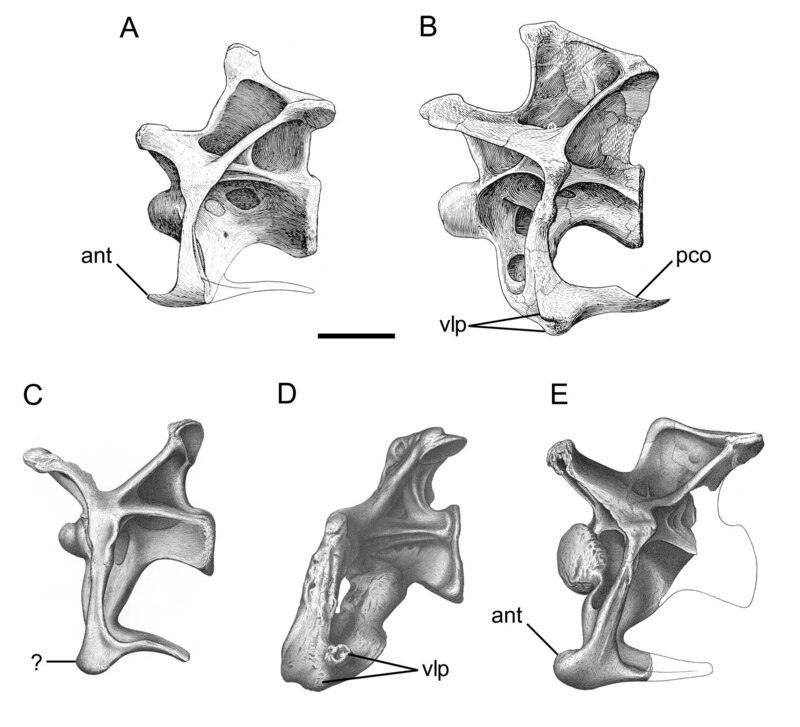 The questions for me are twofold: which Apatosaurus vertebra is it based on, and who did it? 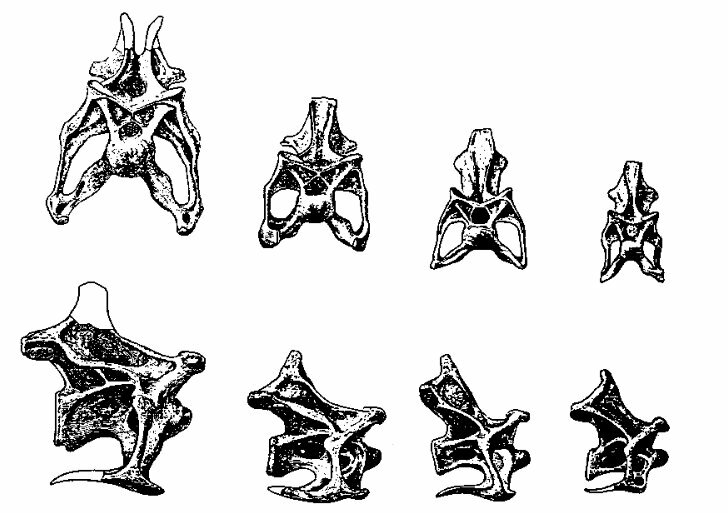 What vertebra is it based on? 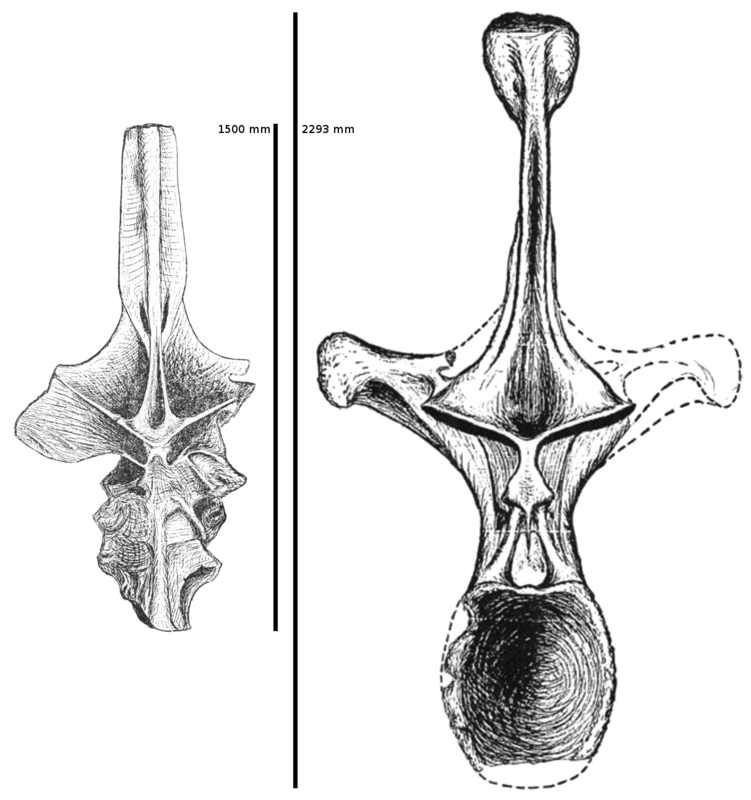 This one resembles the starfighter in the very deep cervical rob loops — deep even for Apatosaurus — and in the small, high condyle. It also resembled the ship in the absence of neural-spine metapophyses (due to breakage, not taxonomically significant variation, alas). The result of their absence is that the “upper wings” (i.e. postzygapophyseal rami) are swept up, out and back, as in the ship. But in other respects it’s very different — notably the very elongate prezyg rami (an effect exaggerated by the breakage) and the more or less parallel trajectories of the top and bottom margins of the loop. This on is rather bulky for a model for the ship, but does have a less wrong shape of the cervical rib loops. 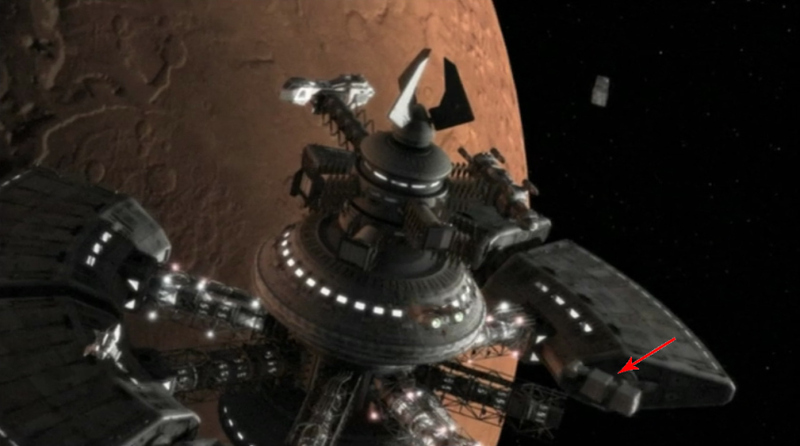 And the damage that blew off both the prezygs and the metapophyses leaves the isolated “wings” on the top, just as in the ship. 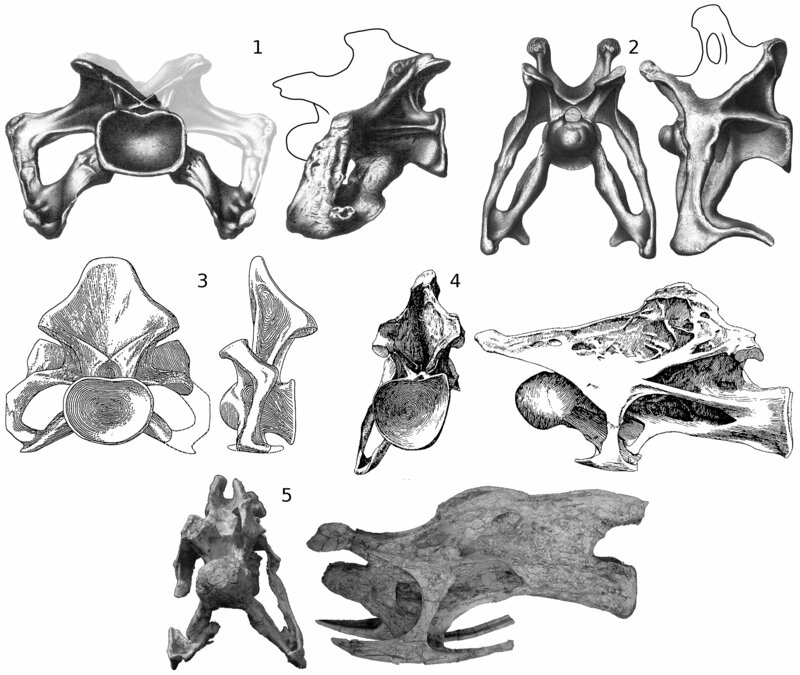 It has good, deep cervical-rib loops; a definite bend from the fairly lateral upper part to the more ventrally inclined lateral part; a high, fairly small condyle; and a definite bulges where the parapophysis fuses with the cervical ribs, corresponding to the weapons pods of the starfighter. 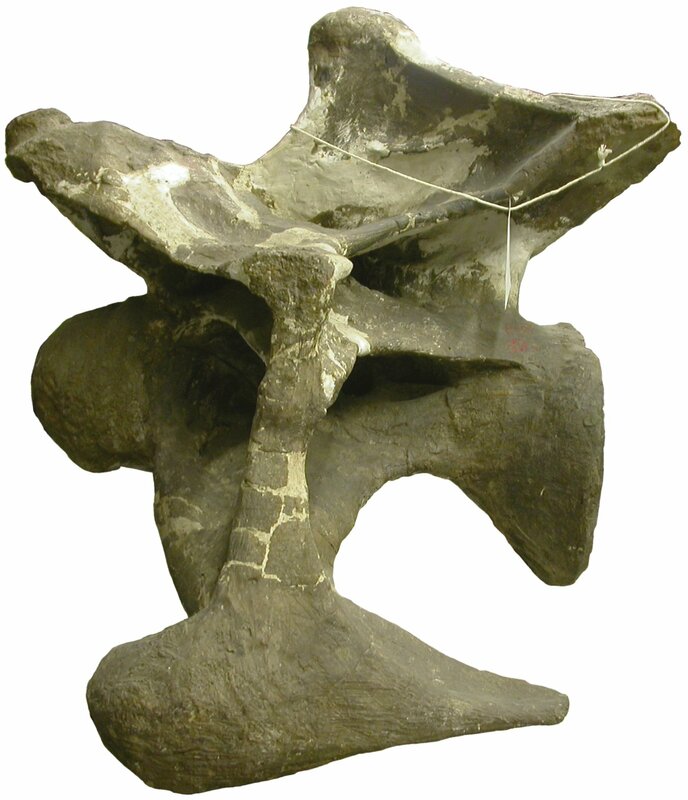 I can’t shake the feeling that I’ve seen another Apatosaurus vertebra somewhere that is a more or less perfect fit for the ship. But I can’t remember where I saw it. Come to that, I can’t think what specimen it could be from, if not one of those that Matt and I have shown in these posts. The other mystery is — whose work is this design, and where did he or she get the shape from? In a comment on the last post, I said to Matt that “one can hardly help but suspect that Jarrod did it on your instruction”. (Jarrod is an old friend of Matt’s who works in digital effects for film and TV.) But Matt insists it’s none of his doing — and I must say that if it had been in any way his work, he would have been shouting about it long before now. 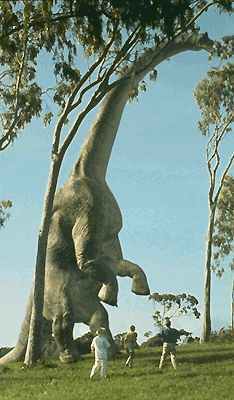 There is another sauropod (sort of) in Episode IV (sort of), but I’ll wait a week before I blab about that one. I wonder if anyone will guess what it is in the meantime? 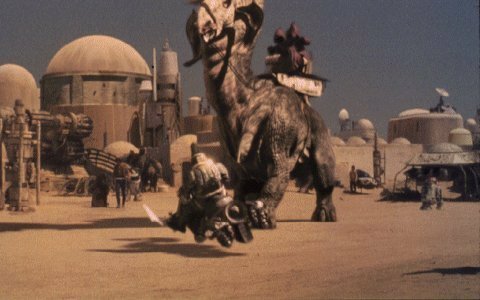 It is apparently no secret that the Rontos briefly glimpsed in A New Hope: Special Edition and The Phantom Menace are morphed versions of the Brachiosaurus from Jurassic Park. 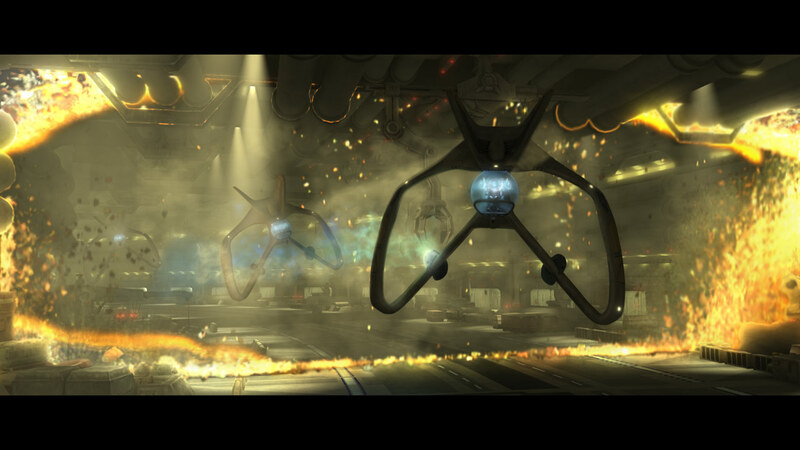 The rontos added into the Mos Eisley scenes for the Special Edition release of A New Hope are entirely computer-generated. 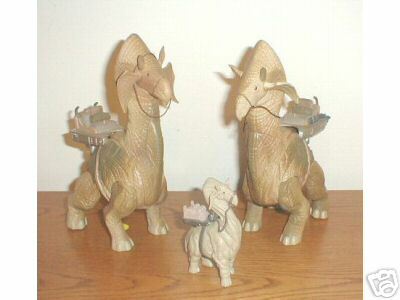 It was a cousin of sorts to the digital models crafted for Jurassic Park; the ronto used a brachiosaur as a starting point with enough modification to make it distinctly Star Wars. Throughout the making of the sequence, the ILM animators referred to the otherwise nameless creature as a “bronto.” When asked to name the animal, George Lucas dropped the ‘b’ from the name, and thus the ronto was christened. Rontos are apparently allergic to photography (possibly related to Nessie? ), as I found just about zip for decent images in my exhaustive 10-minute web search. I did learn that there is a competitive rib-eater named Ronto, who got a beat-down from Joey Chestnut, who ate 8.4 lbs of ribs in 12 minutes. Someday I will do a post about all the wacky search terms that bring people to SV-POW! “Basement” is always in the top 20, which must be a surprise for those folks who just want to remodel their cellar. Next week we’ll get back to science. Almost certainly.